INCREDIBLE DEAL - NOW ONLY $429.95! POWERFUL SHIMANO HYDRAULIC DISC BRAKES. The Windsor Trail FS COMP equips you with one of the best names in the business. Shimano. Shimano hydraulic brakes. It is Unheard of to have Shimano hydraulic disc brakes at this sale price of only $429.95. Customers have told us other brands of mountain bikes like Trek, Specialized and Giant mountain bikes with hydraulic disc brakes cost around $800 to $1,000 locally. PLUS - Advanced LockOut Suspension Forks from SunTour. High end Proven performance without breaking the bank. Thousands of full suspension mountain bikes have used this proven suspension design. Lower maintenance than multi-link systems and more durable as well. The awesome parts spec includes the advanced LockOut Suntour Adjustable long travel suspension forks. Quality SRAM 24 Speed derailleurs with a super comfy WTB saddle. Sure-stopping with powerful Shimano Hydraulic Disc brakes and superior traction with knobby Offroad Tires - who needs more? 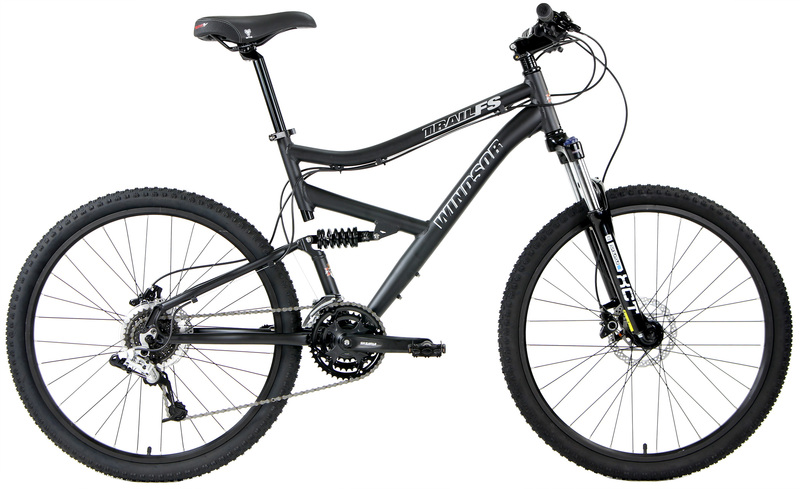 15 inch = Sml fits* up to 5'6"
17 inch = Med fits* up to 5'8"
Frame 6061 Aluminum Trail Tuned Geometry with replaceable rear derailleur hanger and Optimum profile Aluminum downtube with reinforced downtube gusset.